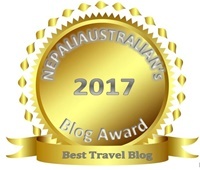 Put the award logo or image on your blog. Share link to your best blog posts. 1.When you were a kid, what did you want to be when you grew up, and did that happen? When I was a child I wanted to be a fashion designer or a flight attendant, maybe that passion for travel has always been with me! I never pursued these careers. 2. What is your all time favorite meal to eat? 3. Are you a pool person or a beach person? Definitely a beach person, I just love sitting on the sand and staring out to the ocean beyond. What has been your favourite holiday destination and why? Name one thing you cannot live without? What is your favourite book, if you read? Thank you Lauren once again for this nomination and I look forward to reading any responses from those who wish to participate in this Mystery Blogger Award. *Mystery Blogger Award picture uploaded from web. Nice to get to know you a bit – I also love sitting on the beach and looking out at the ocean. It makes me think of all the travelers from long ago who crossed oceans to start new lives. Happy blogging! Thanks so much for the award! It is nice to be thought of 🙂 Have a lovely weekend. I loved reading your responses!! I haven’t yet had the opportunity to try Sri Lankan curry, but it sounds wonderful and I also love seafood! I would hands down visit Hogwarts as well if I could! Enjoyed this post. I am the beach person all the way as well and love curry! Honestly I can’t pinpoint where it has come from. I remember watching Alfred’s Birds as a young girl, but then my mum tells me I was chased by a pelican at the zoo when I was younger as well, so maybe it’s a combination! Silly, I know.. ..
A pelican can chase little girls? 😀 That was a cute image! My only memory of being chased by any flighty thing is that of a duck. It lowered its neck and came straight for me like an arrow. Congrats! I am also more of a beach person and have a fear of birds. Especially large ones. Yikes! Omg. No way. I would have died. My mum tells me I was chased by a Pelican at the zoo when I was young. I can’t remember it, must have blocked it out and my fear may have stemmed from there…… bloody birds!